Origami flowers are popular as home decor, wedding decorations, or special occasion gifts. There are flower designs to fit every skill level, so even a novice paper folder can easily whip up a few pretty blooms. 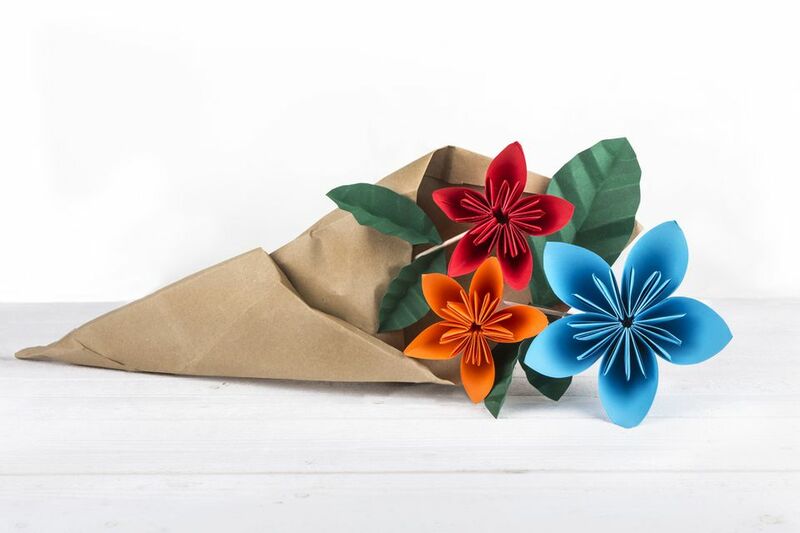 This guide explains some of the many different types of origami flowers you will find and provides links to detailed instructions for each project. The Japanese word "kusudama" can be translated as "medicine ball." The kusudama flower is made of several identically folded units that are glued together to make the finished flower. Typically, the flower has five or six petals. If desired, several kusudama flowers can be glued together to make a large hanging ball. The origami kusudama flower is very easy to fold. If you are new to folding origami flowers, this is a great place to start. The origami lily is a traditional paper folding design that is made using a square base. It is suitable for advanced beginners. Gently curling the flower petals helps give the folded lily the most natural appearance. Finished origami lilies can be displayed individually or incorporated into a larger floral arrangement. The Kawasaki Rose is a model designed by Japanese artist Toshikazu Kawasaki. His rose uses a twisting maneuver that the makes the petals look like they curl out from the center of the flower. Although the Kawasaki Rose is very beautiful, it is a model for advanced paper folders. Canadian origami artist Joseph Wu has a downloadable PDF diagram of how to fold the Kawasaki Rose on his website. The diagram was done by Winson Chan. Winson Chan learned how to fold the Kawasaki Rose from Joseph Wu, who learned the folding steps from Toshikazu Kawasaki himself. The origami lotus flower sometimes called an origami water lily, is an intermediate level design that is best done using very thin origami paper. You need to be very careful pulling the paper in the last few steps in order to keep it from tearing. Sometimes, people will place ​small battery-operated tea lights in the center of this flower to make a pretty lantern. This is especially popular when using the origami lotus flower for a wedding decoration. If you've ever been fascinated by an origami flower arrangement that looks exactly like a vase of freshly picked flowers, you were probably looking at origami bonsai. Benjamin John Coleman's Origami Bonsai website has a free downloadable magazine and video tutorials that teach people how to make their own gorgeous origami floral arrangements. You must already be familiar with basic origami techniques before attempting to make these realistic looking flowers, however. Florina Mitrea's Florigami site has many beautiful examples of origami bonsai to inspire your creativity. Flat paper origami flower designs can be used to decorate a handmade card or a scrapbook page. This origami sunflower can be made to display a favorite photo. It is folded from eight sheets of yellow notepaper. Not all origami paper flowers are flowers in the traditional sense. The flower design has been incorporated into many other types of projects, including this simple origami flower box.